At the top of my New Year's Resolution list is finishing my mother's Candlewicking Hearts and Flowers Quilt that is about three fourths done. I have completed three quilts as a warm-up exercise to prepare me for this project. It is all hand-stitched and I plan to complete it in the same way it was started. finish the entire quilt, God-willing. with ribbon and lace. It is no less than exquisite! I realized after she died that I either forgot to ask her about her plans for this quilt, or simply forgot what she said, though I quickly offered to complete it for her as she was physically declining and struggling to complete it. I knew that the pattern was original, though some of the candle-wicking blocks came from a magazine, that I can't seem to find now, though she had a pulled out the attached pattern from the same magazine that has some of the same blocks detailed in about one-fourth of the size of her sixteen fifteen and one half inches blocks. The blocks have all been completed and she has also completed the short sashing strips that go between each block of the remaining row that needs to be jointed together, with, the long sashing strips on either side that have not been cut or sewn yet. The other three rows of blocks have all been stitched together. She has made it using a quilt-as-you-go technique. 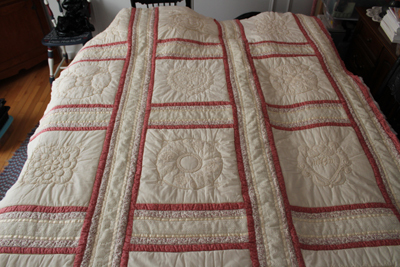 This means that she sewed and quilted each section of the quilt, and then sewed each pre-quilted piece by seaming the top first, then the batting and then the backing to join the pieces together. 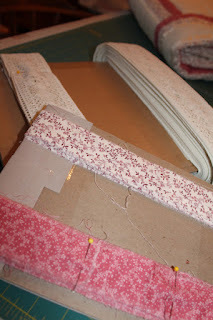 It is a very labor intensive way to quilt a quilt, but works well if quilting the entire quilt would be too cumbersome to do without a quilting frame. embellished with ribbon and lace. section of the quilt and then quilt next to the adjoining seams. Each sashing strip has eighteen rows of hand-stitching in order to make it, embellish it with ribbon and lace, quilt the strip and then attach it to the adjoining section of the quilt as described above, and then quilt next to the adjoining seams. Some of the joining seams on the back side have not been done in her nicest of stitches. As I said she was beginning to deteriorate physically by the time she got the quilt to this point and so I shall re-do any hand-stitched seams where her stitches became too big and are less secure or stitched in such a way as to create puckers and I will do this before I join the last row of blocks with their sashing strips. I hope to add a final row of sashing horizontally across the top and bottom of this quilt as well that will finish off all sides of this quilt and it appears that there are just enough materials to do that, though measuring twice and cutting once is my rule of thumb! Sometimes sampler quilts like this can have final borders around the entire quilt, but I think such borders may be too much with all the embellishment she has added to the sashings? If anyone has other ideas regarding how this quilt should be finished, I would be open to hearing about them. At the time I promised to finish this quilt, I was more focused on taking care of her, as well as my own family! Any caretaker will appreciate the exhaustion that goes with accompanying a precious family member to their death. 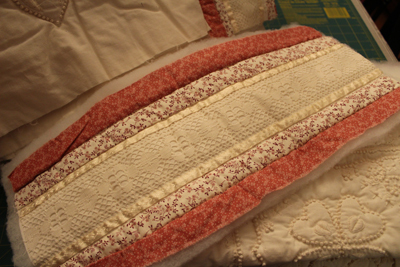 It is an emotional and physical strain losing someone so dear and to be certain, more thought was given to her than to actually finishing her beautiful quilt. I promised her that I would finish it and I will, though it is only the beginning of finishing many other quilts started long ago. I am now keeping all my thoughts and plans for my quilts in plastic sleeves that I keep with each quilt. This idea is not original to me. I once went to a quilter's estate sale and joked that I was going to cut all my materials up before I die, and one of the people putting on the estate sale didn't see the humor in my comment. She added rather curtly, "then keep the pieces all together with directions included to make it easier for those that will follow and finish your quilts". As with many quilters, there may be too many quilts to finish in my lifetime? I am praying that Mom will send her spirit to guide me through the finishing of her most beautiful quilt! It is bizarre, but to keep me attentive to this work, I have added several other quilt tops to be done in a block by block fashion, incrementally throughout this year. With having a variety of projects and sewing tasks, I shouldn't suffer from the usual tediousness that I experience finishing quilts. I am not sure that other quilters feel as I do, but starting quilts is easier than finishing them for me. Moving from quilt to quilt, should help maintain my interest in all of them. I prefer variety when I sew, as I don't have the patience that my mom had to stick to only one project at at time! I reward my persistence in sticking to finishing a quilt by having several other less challenging projects going at a time. 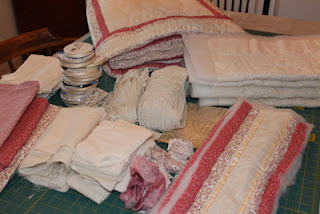 Did I mention that I am a fabricaholic?! scrap quilts. It is fun to see them grow and each is unique! The more I make the more individual quilts that I can make. Quilting them on my quilting machine should be fast and easy. primitive, colorful, and provide much hand-applique practice! Labels: finishing an heirloom quilt; candle-wicking embroidery; embellishing a quilt with lace and ribbon.